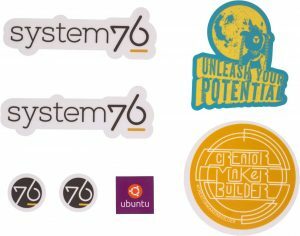 Free System76 + Ubuntu stickers! Send a self-addressed stamped envelope (at least 3.5×5″ to prevent folding) to your local address below and get a set of free stickers. Because we love you. And we all love Ubuntu! Wyślij zaadresowaną kopertę z naklejonym znaczkiem. Thanks to the Portuguese Ubuntu LoCo Team!